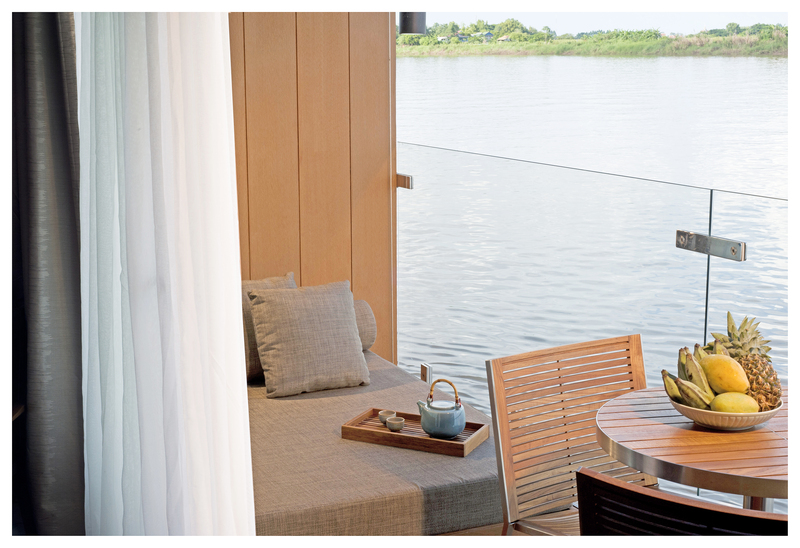 When we pull up alongside the river I don’t notice the Aqua Mekong at first. What I see is a sleek, luxurious condo all matt grey and dark slatted wood. Then the penny drops: this is the boat. 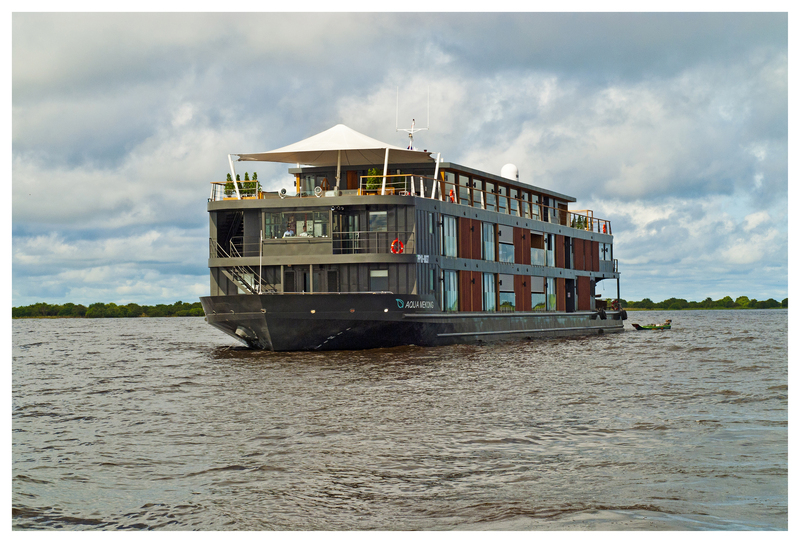 Aqua Mekong is the new, boutique (just 20 cabins) river cruiser from the exclusive Aqua Expeditions owned by Francesco Galli Zugaro. Inside the cabin too the boat feels like an apartment. 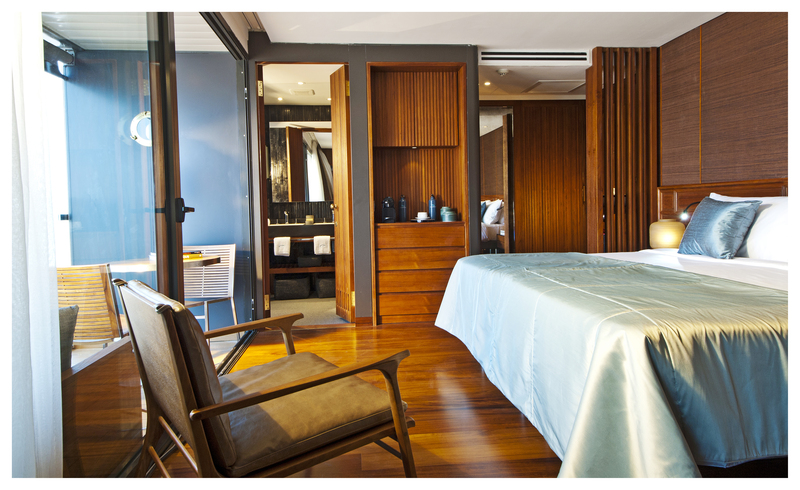 There’s floor to ceiling windows and an abundance of teak wood mixed with muted silks. 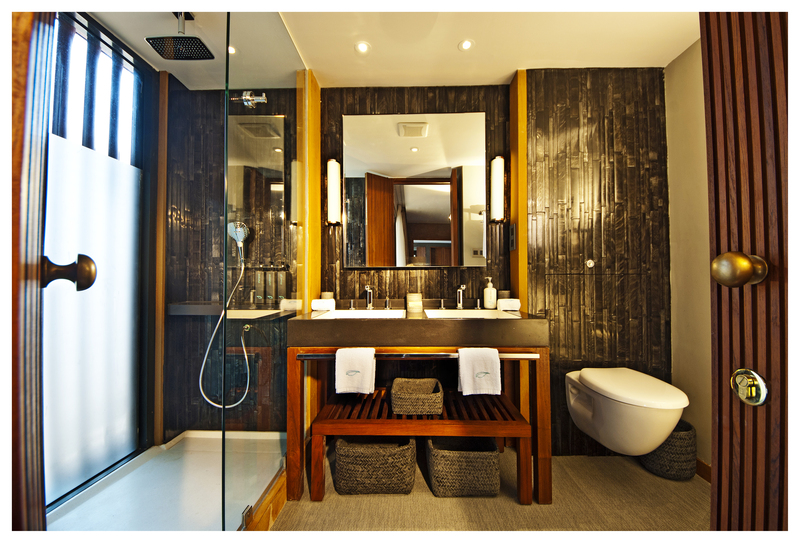 Even the bathroom is spacious and stunningly designed with twin basins, black tiled walls and large shower. We’ve opted for a balcony room that gives us the opportunity to lounge on a shady day bed and watch the scenery go by. Upstairs on the top deck are more al fresco lounging opportunities with gazebos at the bow and a cooling plunge pool at the stern. For the more energetic there’s a compact gym with a bird’s eye view of the river. We’ve joined the four-night journey upstream from Ho Chi Minh City, Vietnam to Phnom Penh, Cambodia (there’s also a three nighter in the reverse direction and an eight day trip that takes in the Tonle Sap lake in Cambodia as well). 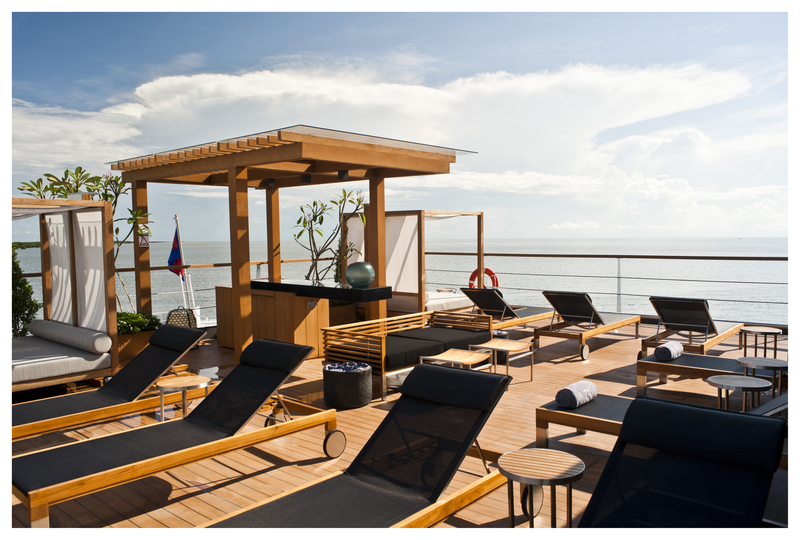 When we set sail that first evening it’s against the backdrop of a glorious sunset, glasses of chilled wine in hand. The next morning reveals how overwhelmingly wide the Mekong is and that it’s a busy working river: we pass an endless stream of vessels carrying sand or cargo containers. Two excursions are on offer every day in the early morning and after lunch, except for when we cross the Cambodian border on the third afternoon. 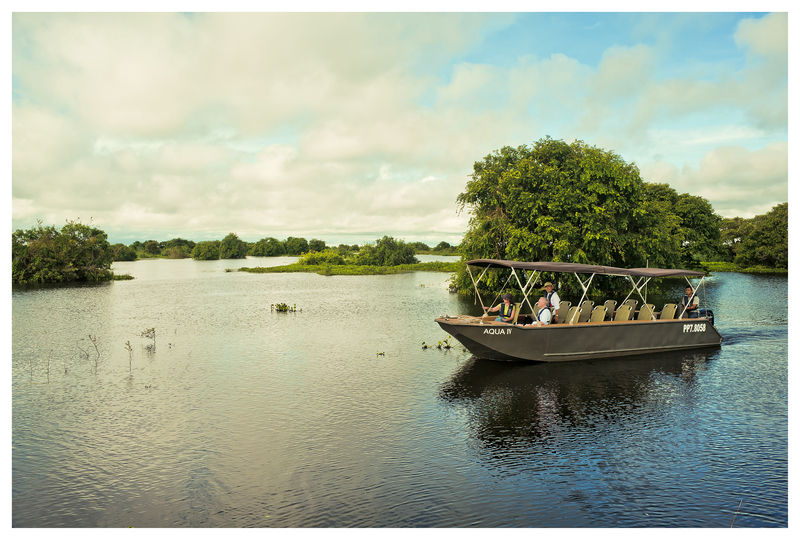 Specially designed skiffs take us from the Aqua Mekong to narrower waterways where we weave through water hyacinth and pass stilted houses. In Vietnam’s Mekong Delta we visit a floating market where merchants ply fruit and vegetables from wooden boats with eyes painted on the bow and a bamboo pole flagging their wares; and a vast, peaceful bird sanctuary set in wetlands and accessed via quiet canals. On each trip we’re accompanied by one of the three personable guides: Tuyen, Visoth and Hoeum from Vietnam and Cambodia respectively and each with their own style and humour. On land, the sportier types opt to go by bike while the rest of us meander on foot or in a cavalcade of tuk tuks. Along the way smiling children rush out to say “Hello! Hello!” Back on board, not only are we greeted with chilled towels and fresh juices but our footwear’s taken to be cleaned then promptly deposited outside our cabins. 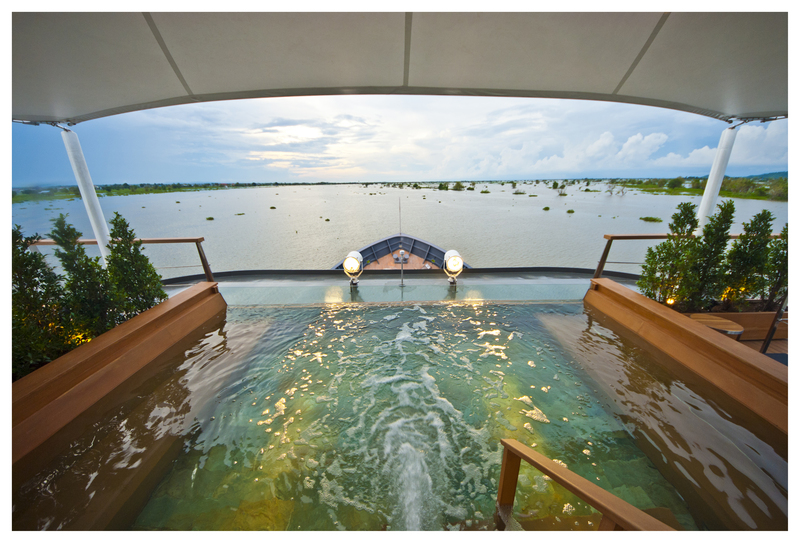 Unlike many cruises, the Aqua Mekong always docks in the middle of the river (having the luxury of its own launches to take guests to and from land) so there’s still a panoramic view for anyone who opts out of the excursions. We stayed on board one afternoon and while we regretted not joining the excursion it felt like having our own yacht for a few hours. 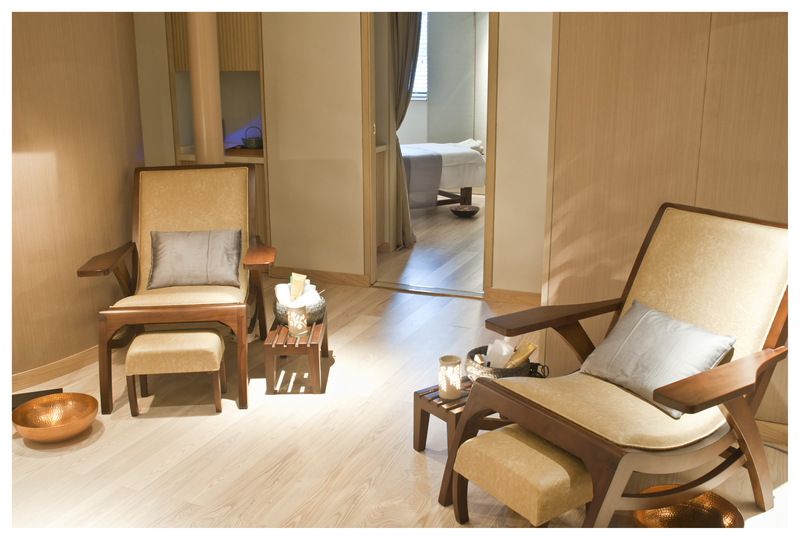 In between excursions there are massages in the spa (try the excellent traditional Khmer), lectures on local life in the air-conned bar and films – in the screening room or outside, under the stars in the evening. Apart from a top deck barbecue one evening meals are in the dining room, set up like a regular restaurant so there’s no enforced groupings as on sea ship cruises. We all tended to stick to the twos or fours we arrived in though there were lots of cross table chatter and post meal mingling. 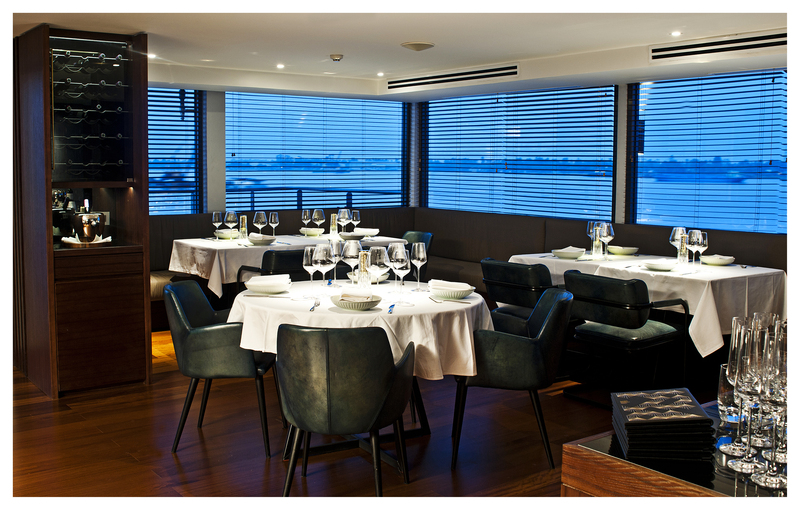 Food is also a draw on the Aqua Mekong with the renowned David Thompson of Nahm in Bangkok overseeing the menu. Dishes alternate between Asian and Western using produce picked up along the way. Your taste of the Mekong may include beef pho and chicken laksa for lunch and more elaborate tasting menu dinners of minced chicken, pork and prawns simmered in palm sugar; crab and pickled garlic on crunchy rice cakes; chicken curry; stir fried prawns and garlic chives and steamed sea bass with yellow beans, ginger and Asian celery. As we cross into Cambodia on the penultimate day the river becomes narrower and the banks more verdant. We spot white oxen on the water’s edge, either working the land or being led to the river to bathe and drink. By late afternoon the fishermen are casting out nets from their sampans. We’re going at quite a pace but our boat moves smoothly with a gentle hum as the scenery whizzes by. When we set foot on Cambodian soil the next day we meet widows who’ve been taught the fading art of silk weaving and produce beautiful scarves. Later we sit with villagers and elders in their homes who tell us about their lives. After our last afternoon excursion we are taken in the skiffs not back to the boat but (spoiler alert) a sand bank. The crew has set up chairs and lanterns and serve up cocktails. The following morning we will disembark in the bustle of Phnom Penh but that evening, we are standing in the middle of the Mekong watching the sun go down. 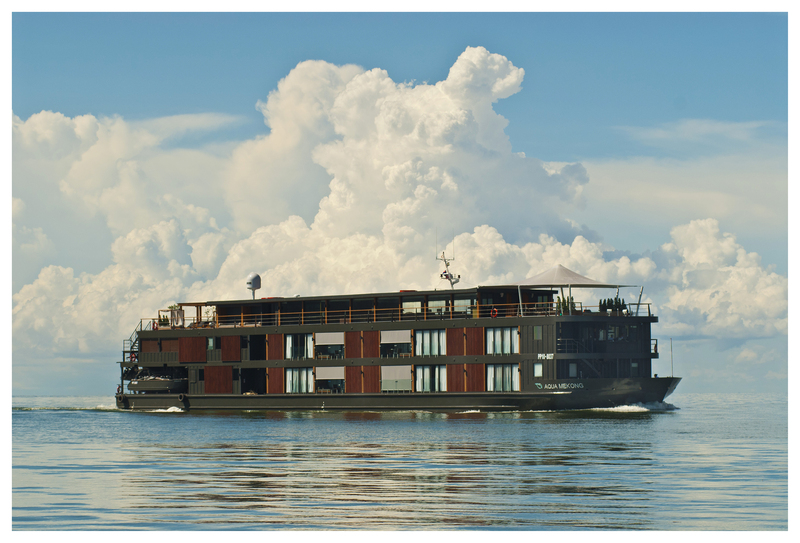 The Aqua Mekong four night cruise costs $1000 per person including meals, house drinks and excursions.